I have to say one of my favourite things about February is how short it is after how painful January always seems. I can't help but wish the weeks away because March brings my birthday and the arrival of Spring which is one of my favourite seasons. But before I get carried away looking ahead, here are a few things that I didn't share on the blog this month. 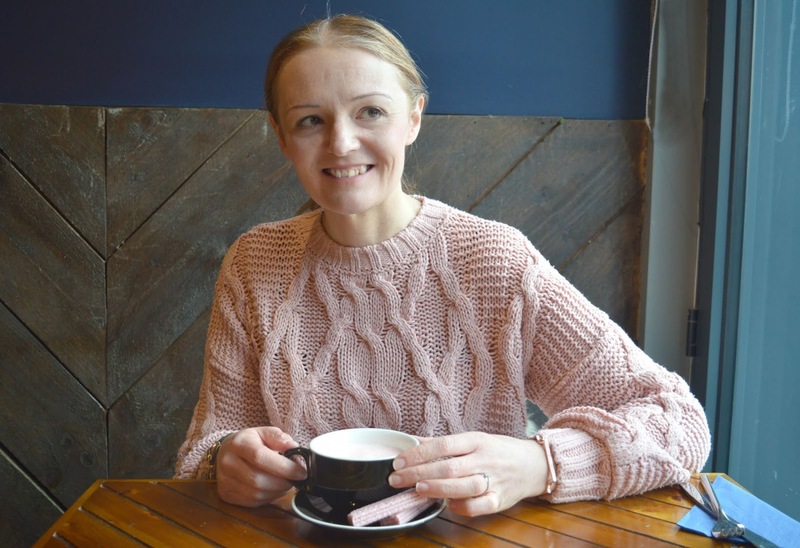 This month the spotlight was on me when I was the very first guest on the The Life Bath Podcast, a recently launched podcast discovering the lives of people in the North East. 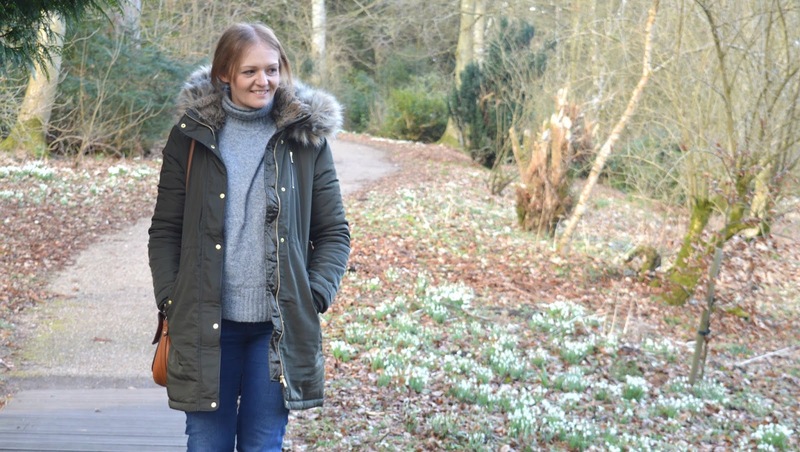 I shared plenty of stories of weight loss, meeting my husband and, of course, how I fell in love with the North East and why I decided to pack up my London life and relocate. If you fancy a listen you can find my episode here. Earlier this month we were out and about in Northumberland when we suddenly realised we were in desperate need of a cup of tea and a sit down, this is when it suddenly occurred to us that we really don't have much of a clue of where to go in the countryside for tea and cake. Luckily we stumbled across Kirkharle Coffee House who saved the day with this mammoth slab of Victoria Sponge. When I got home I asked my Facebook followers for some more recommendations and was inundated with suggestions - so I'm never going to be stuck ever again. Watch this space because I'm going to have some amazing new recommendations for you very soon. Last month I shared with you that my New Year's Resolution is to get my driving confidence back and I'm so happy that I'm going from strength to strength with my solo drives. My biggest achievement had to be last weekend when I drove a completely unknown route down to South Tyneside in very thick fog, I think that was the moment I knew I've really cracked it! I journeyed down to Hive Coffee in Jarrow for a Bee Pollen Latte with two of my favourite ladies. It was my first visit to the cute tea room and I was really impressed, can't wait to go back and try out some more of the menu. I'm pretty sure this is the most impressive transformation you will ever see! 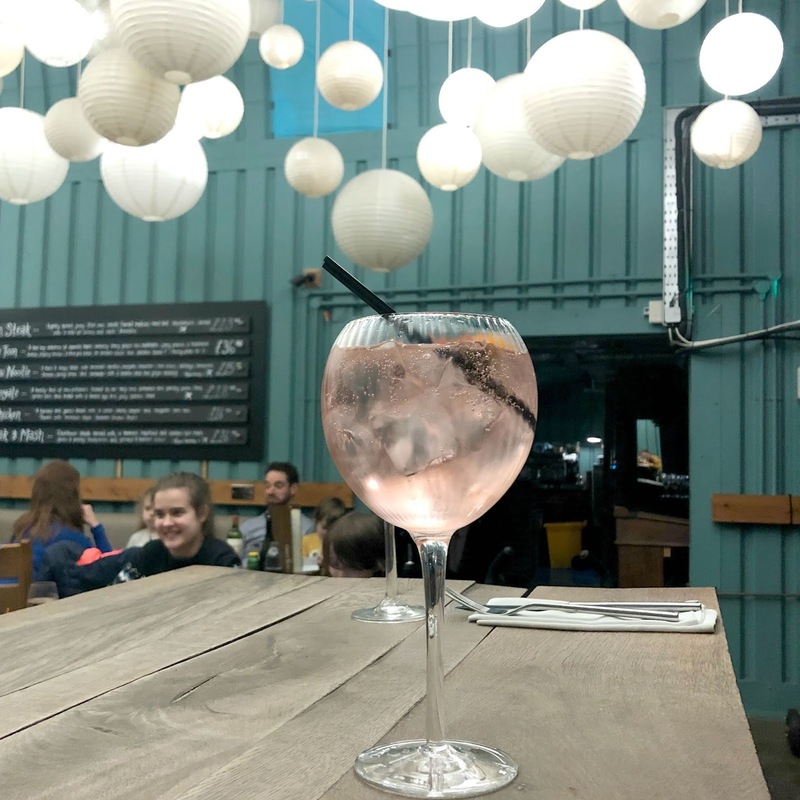 This beautiful bar is The Salt Cove in The Park Hotel in Tynemouth and if you saw how the bar looked before I don't think you'll believe me that they are the same place. The refurbishment is amazing and the new look bar features very fancy chandeliers, floral displays and marble tables. We only popped in for a quick drink but having spotted some rather delicious looking food making its way from the kitchen we're keen to book ourselves in for a meal really soon. This month I decided to give poor Simon a break from playing photographer and actually paid a professional to take a few photos of me around Newcastle. I've been chatting to Laura for years online and although we'd never met I knew we'd get on well so she was the perfect photographer to get the best out of this awkward turtle. We spent hours walking round Newcastle and it was so lovely to be out and about with someone who loves the beautiful architecture of the city as much as me. I can't wait to share the images from our day in future blog posts. Now that I'm getting more confident with my driving Simon is making up for lost time with a few well deserved pints when we're out and about on our adventures. Having chauffeured me around for years I love that he can now enjoy a few weekend drinks and his first celebratory pint was at the newly opened The Split Chimp at Spanish City in Whitley Bay. The micro-pub is the perfect addition to the seafront and we absolutely loved the vibe of the little place - it's a definite must next time you're at the seaside. I have a new favourite lunchtime spot! Batch in Jesmond is the cutest little place that serves a really lovely cup of coffee and delicious light bites on the nicest blue plates. Every time I pop in it seems a little busier than the time before so I think word is spreading that this is a little gem - go visit them before you can no longer get a seat. Ah Pancake Day, the day where we remind ourselves that we're not actually too great at making our own pancakes and so head out to enjoy the best pancakes in the North East that someone else has lovingly made us. 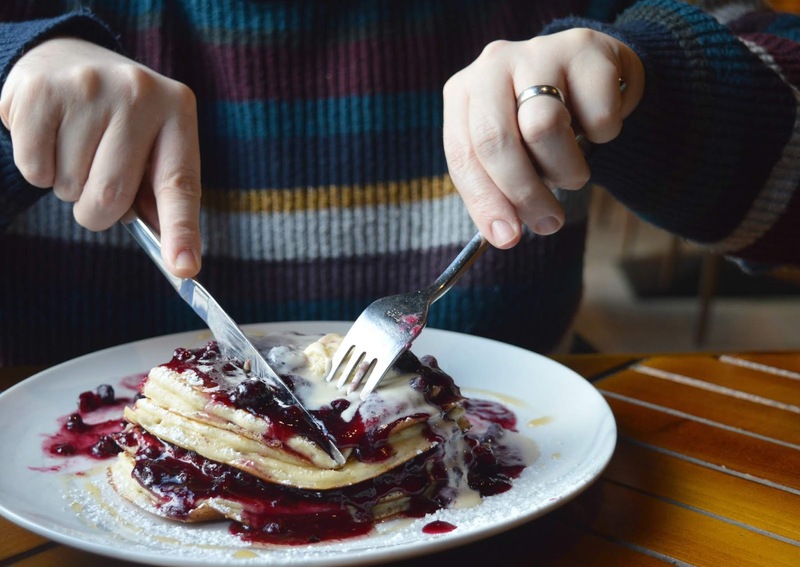 Perhaps we're just being a tad lazy, but who wants to be scraping sticky pancake batter off the floor when they could be enjoying a pancake stack or perfectly prepared crepe at some of the loveliest places in the North East? 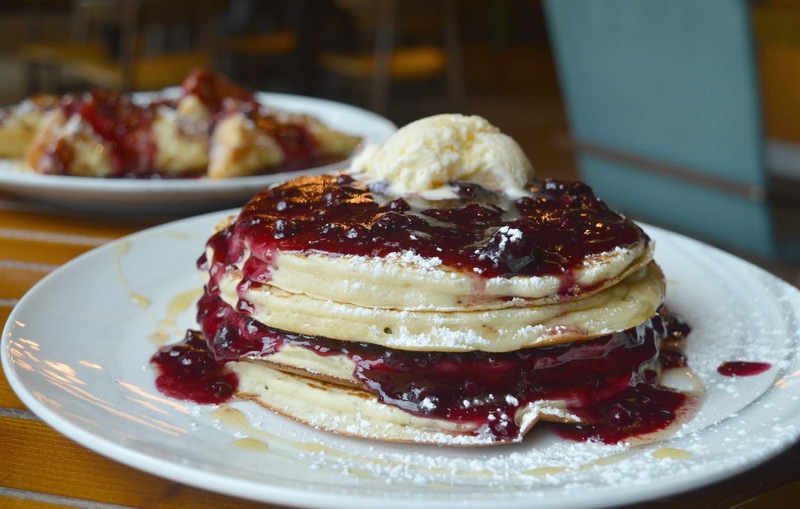 Want to know where to enjoy the best pancakes in Newcastle and the North East on Pancake Day? I think you're going to enjoy this one! 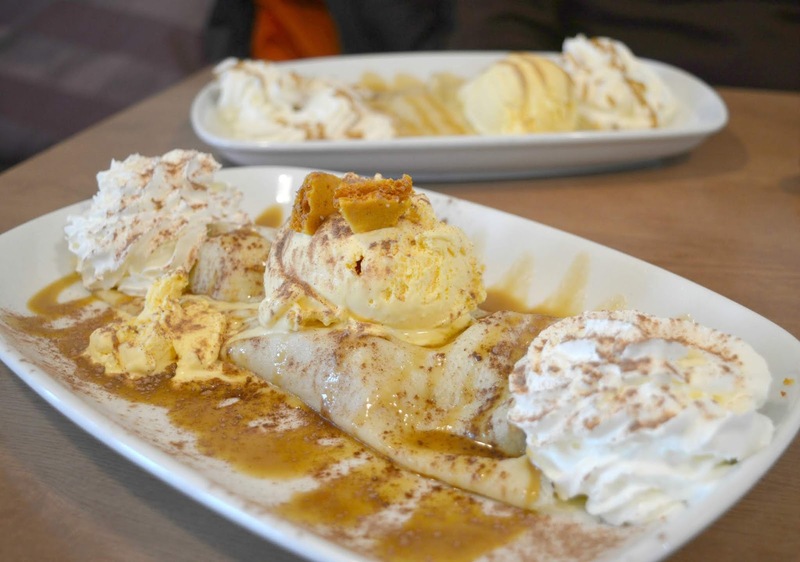 If you find it hard to choose between crepes and stacks then Monsieur Creperie has to be your Pancake Day destination as they have both on offer (hey, maybe you could even go for both?) 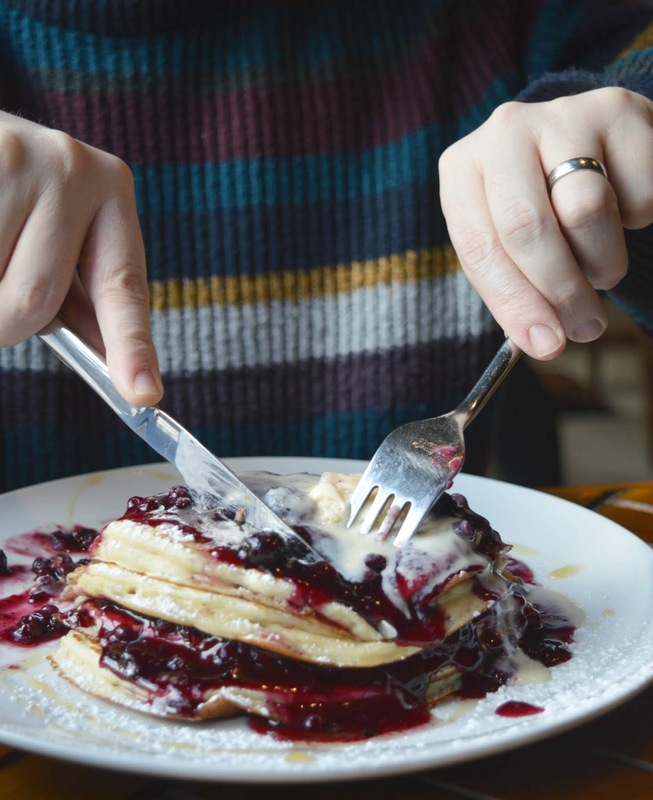 With the largest pancake menu in the North East they offer something for everyone and I can guarantee you will struggle to choose what to go for because everything sounds so delicious. The portions are generous, the staff are lovely and it's the cutest little spot! I obviously had to give a big shout out to Newcastle's hottest new breakfast venue didn't I? They may have only been open a few weeks but their pancake stacks have to be the most photographed dish in the Toon and for good reason. 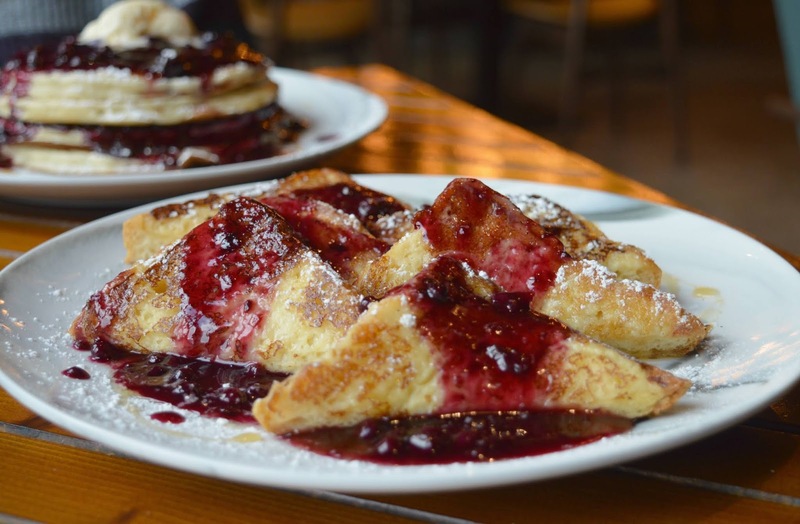 You will need your stretchy pants for their stack, it's huge and the toppings are plentiful - I hear a rumour they might have some pancake specials ready for the big day so make a plan! 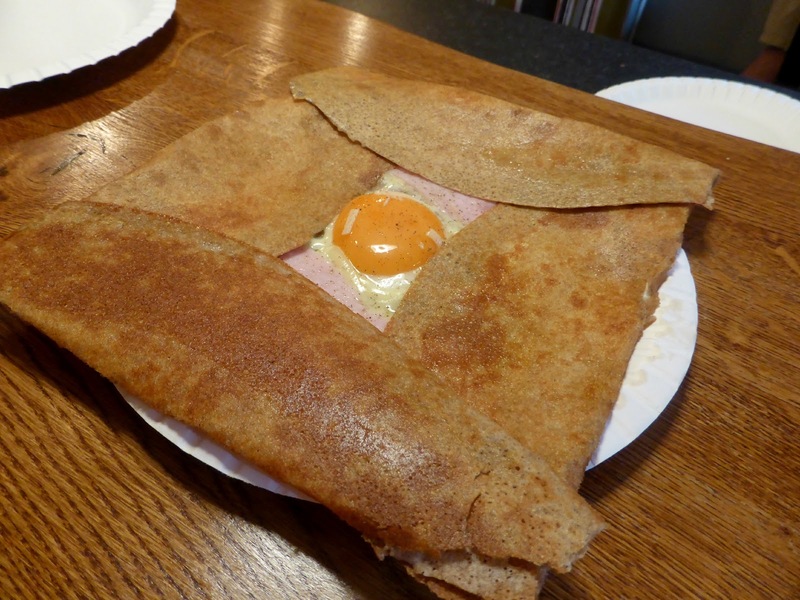 Are you a fan of proper authentic French crepes? La Petite Creperie in Grainger Market really can't be beaten! 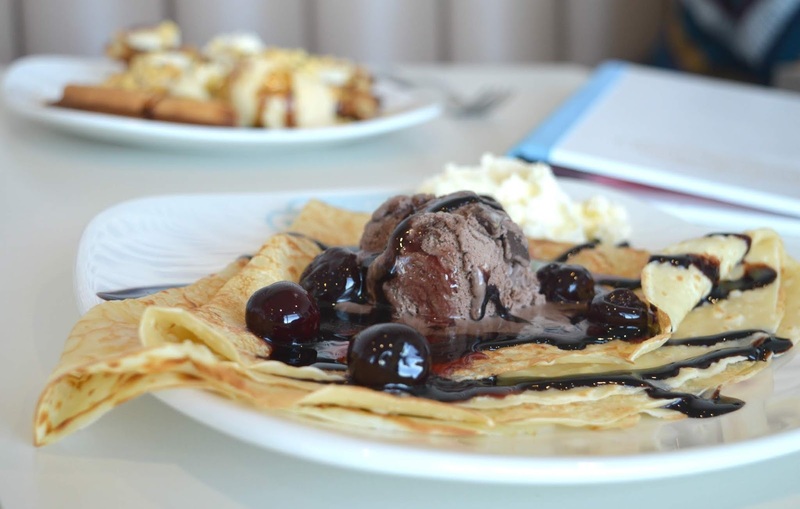 With a choice of savoury galettes and sweet crepes they are the ideal place for a two course Pancake Day feast. Completely different to any other pancake you'll find on this guide, the savouries are thin and crispy with the sweet perfectly prepared fluffy crepes - delicious. 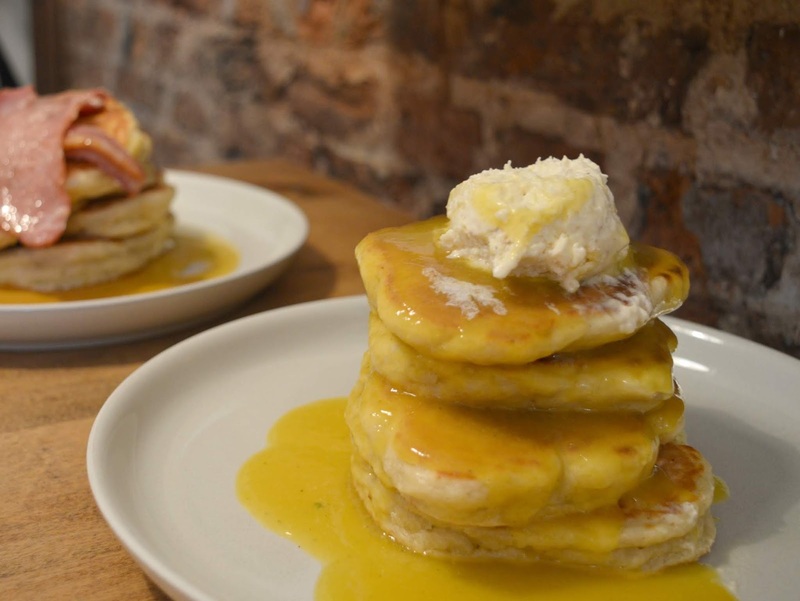 Pretty sure the pancakes at Flat White Kitchen are the most famous in the North East, people queue out in the street for them and even if you turn up at opening time the chances are you'll still be waiting for a table. I think these might be the highest stacks you'll find in the region, they are so thick and so loaded they're in danger of toppling over. This one is definitely for the pancake pros. Homemade pancakes (far better than the pancakes you'll ever make in your own home!) 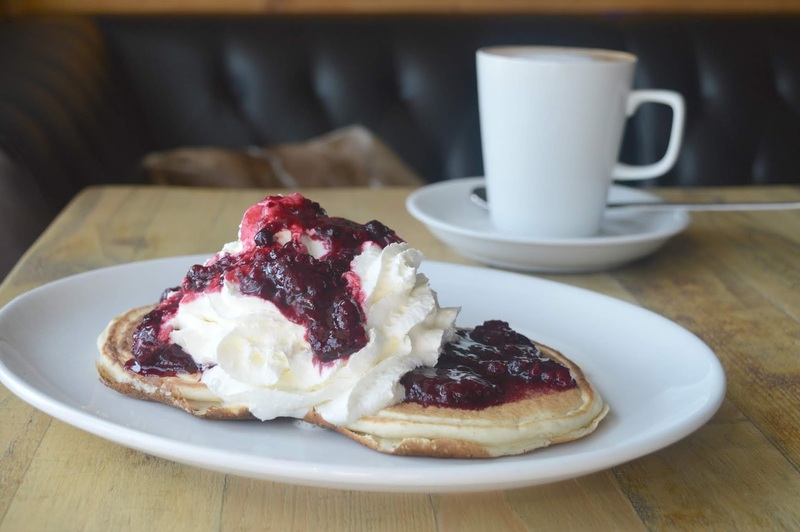 with delicious topping choices, the pancakes at Cafe 19 in Whitley Bay are great if you want to create you own perfect flavour combinations. 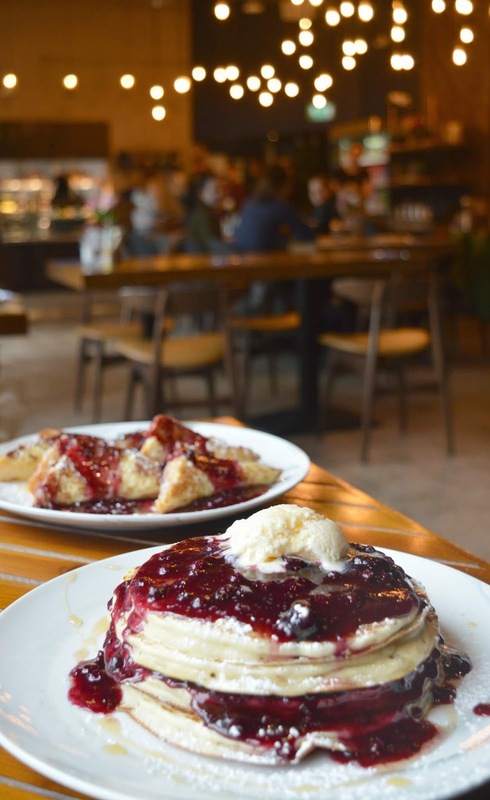 Choose between a variety of toppings - I'm a fan of their homemade mixed berry compote with whipped cream and their pancakes are so light and fluffy. Pancakes without the fuss, the Waffle and Pancake House serve crepes just like the ones at home but without any of that annoying washing up. These pancakes are served in the beautiful Spanish City right on the Whitley Bay seafront and if you really fancy enjoying that stunning scenery you can enjoy them as takeout - pretty sure pancakes by the sea can't be beaten. 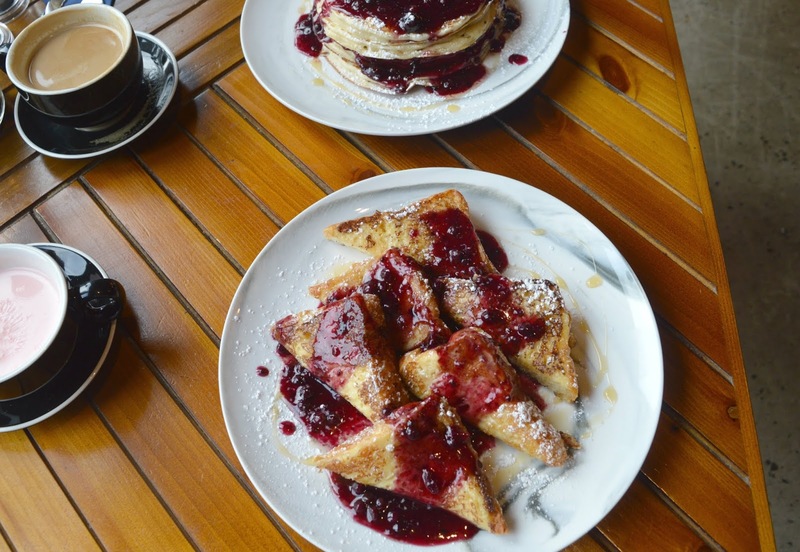 One of the prettiest spots in the North East to enjoy a pancake, you'll find The Pancake Kitchen on Seaham Harbour - ideal for a pancake and a potter! 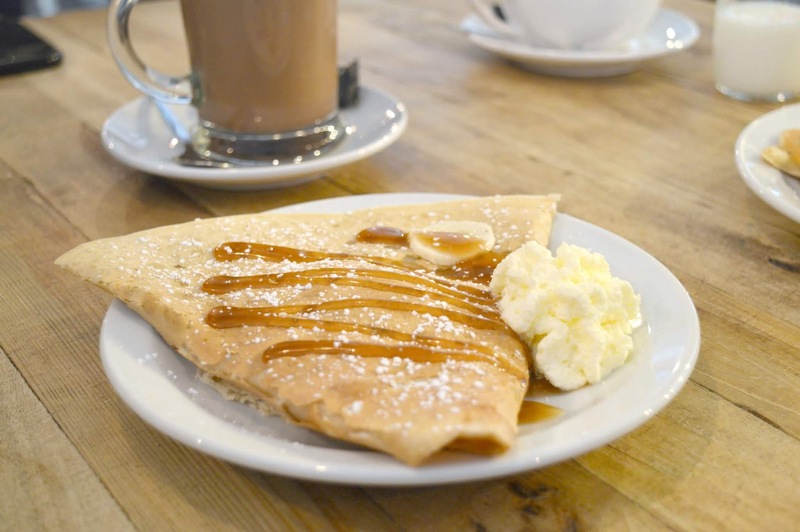 With over 15 savoury and sweet pancakes to pick from the menu is impressive, the toppings are plentiful and if, like us, you love nothing more than dog spotting they are very dog friendly so it's a great place to make some new furry friends. It's pretty impossible for me to write a food guide without including Kiln in Ouseburn, I confess I'm a little obsessed. 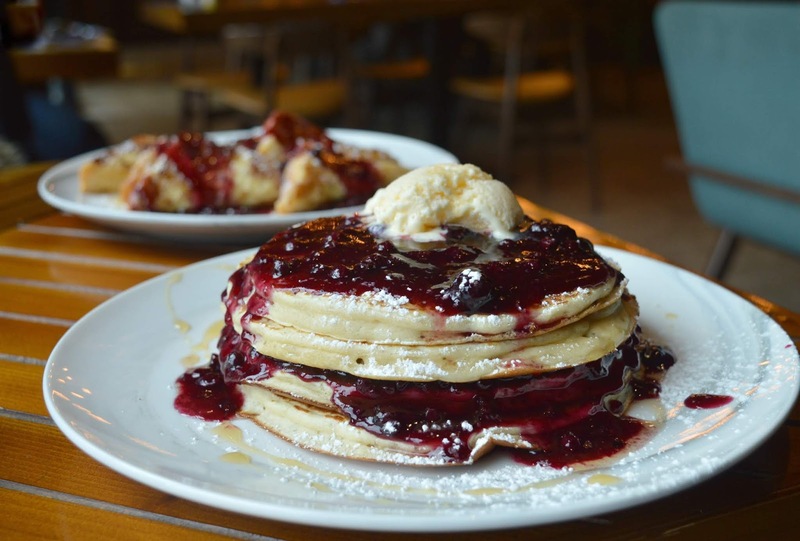 They serve the best brunches, incredible cakes and their coffee is fantastic so it will probably come as no surprise that they also do a pretty banging pancake. Ridiculously photogenic and with so much topping you'll definitely struggle to finish! So where are we heading for Pancake Day? We're actually going to try something new this year! So keep your eye on my Instagram to see where we end up. Where do you like to go for Pancake Day? I'd love to hear if you have any other recommendations. The Herb Garden Newcastle - Not Just About the Pizza! I never thought it would be possible to go to The Herb Garden and not order pizza! The Herb Garden is easily one of the best places in Toon for a fully loaded pizza, it's never occurred to me that there might be other dishes on offer. Why bother to look at another part of the menu when the pizzas are so perfect, am I right? 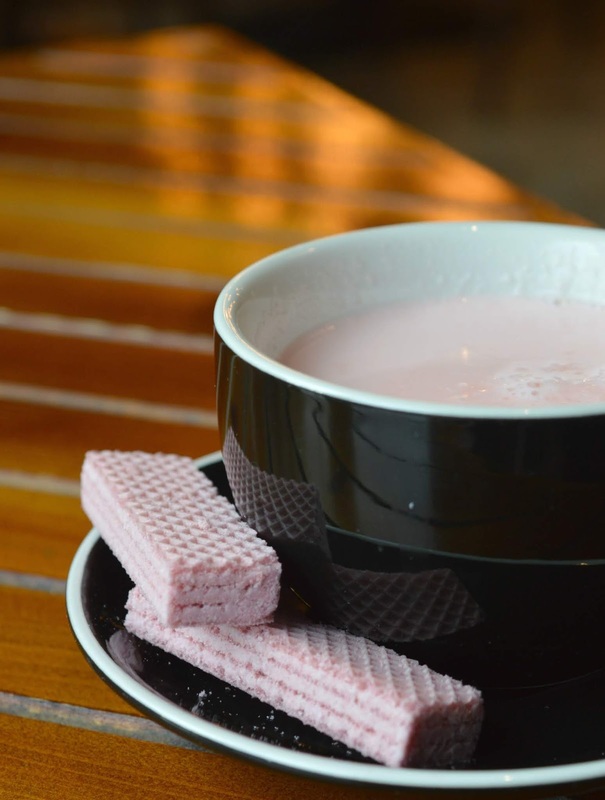 So when Herb Garden invited me to pop in to try out their new look menu I made a promise to myself that I would open my eyes to other offerings. A night out at Herb Garden with no pizza - this was going to be a first! If you've never visited Herb Garden (not wanting to be rude, but where on earth have you been?!) then you really must make a plan to visit. 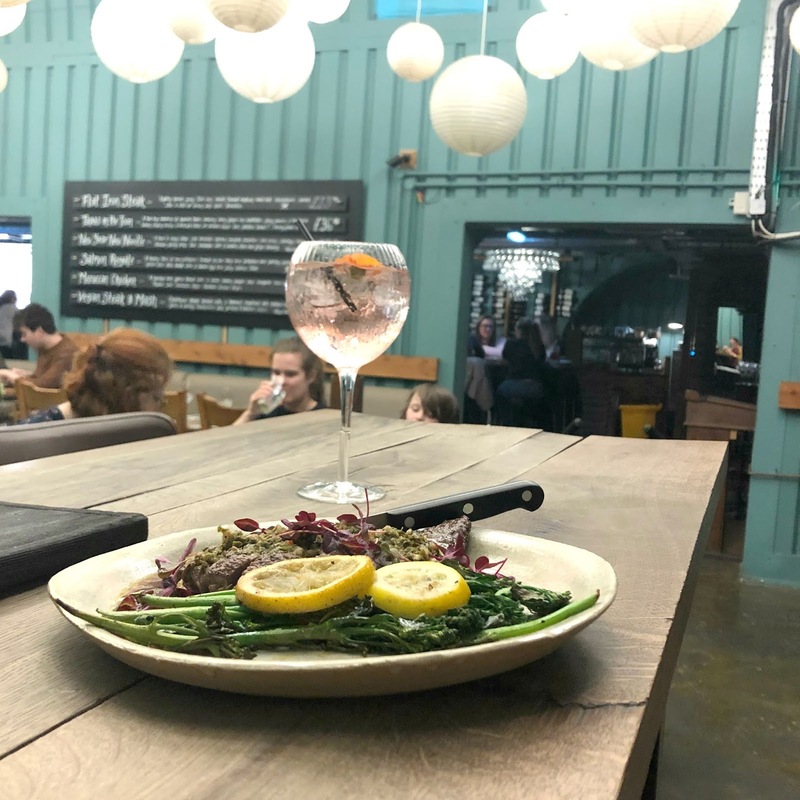 You'll find the beautiful restaurant under the arches close to Central Station, so close in fact that meals are often accompanied by the sound of rumbling trains on the tracks above your head. The lanterns suspended from the ceiling have to be one of the most photographed things in the Toon, and did I mention the pizza? As it was my friend's first visit I informed her that, no questions asked, she HAD to order a pizza! So she went for the one new pizza on the menu, the "Number 12" - Tomato, Mozzarella, Chicken, Garlic and Sweetcorn. Herb Garden have such a great pizza menu there really isn't any need for them to change so if you love their pizzas don't worry - you'll still find a fully loaded menu. 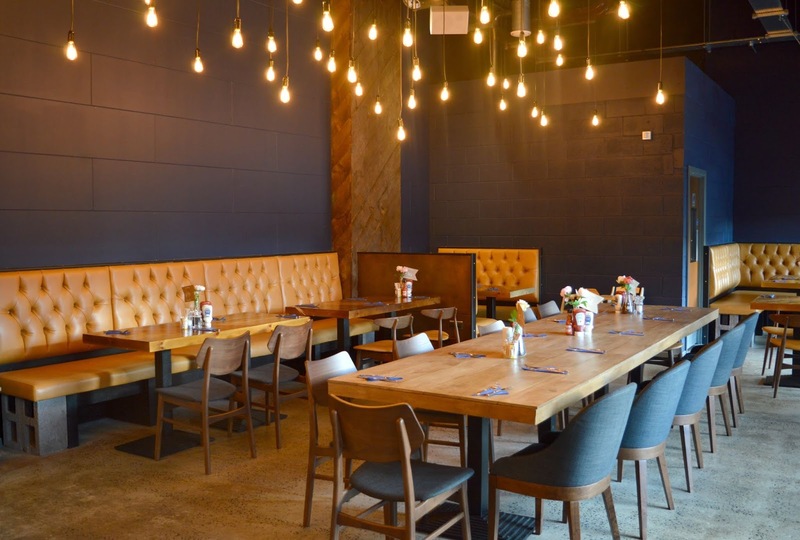 The main changes to the menu are additional sides and starters to compliment dishes, a lovely range of salads and a bit of a refresh to the Specials Menu. The Specials Menu is where you'll find the majority of the new dishes and it's the best place to look if you're fancying something other than pizza. There were some delicious sounding options when we visited including Salmon Royale and "Tapas in the Toon" - a sharing platter for two that would be perfect with a few drinks! I decided to order the Flat Iron Steak (£13.00) - lightly spiced juicy Flat Iron Steak and Chimichurri served with Lemon and Chilli Broccolini. The menu stated that the steak came served "medium-rare" which isn't my usual choice for steak (I only ever like my steak served rare) but I decided to give it a go. The presentation of the dish was absolutely beautiful, and looked so good I probably took way more photographs than I needed to, I'm such a fan of well presented food and this plate just ticked every box. I loved the "no fuss" of the way the steak was served, all too often steaks are drowned in sauces and served with so many accompaniments that it kind of takes the shine off the main element of the dish. The Lemon and Chilli Broccolini was delicious and I really loved the Chimichurri, the perfect accompaniment to the Steak. Unfortunately it hasn't tempted me to switch my usual order from rare to medium rare, it was tasty but nothing will ever beat a perfectly pink steak. Now, I know this will definitely shock my regular readers, but we decided against having dessert on this visit. It's a shame really as the Herb Garden desserts are beautiful, but we just didn't have the room this time! Good excuse for another visit if you ask me. 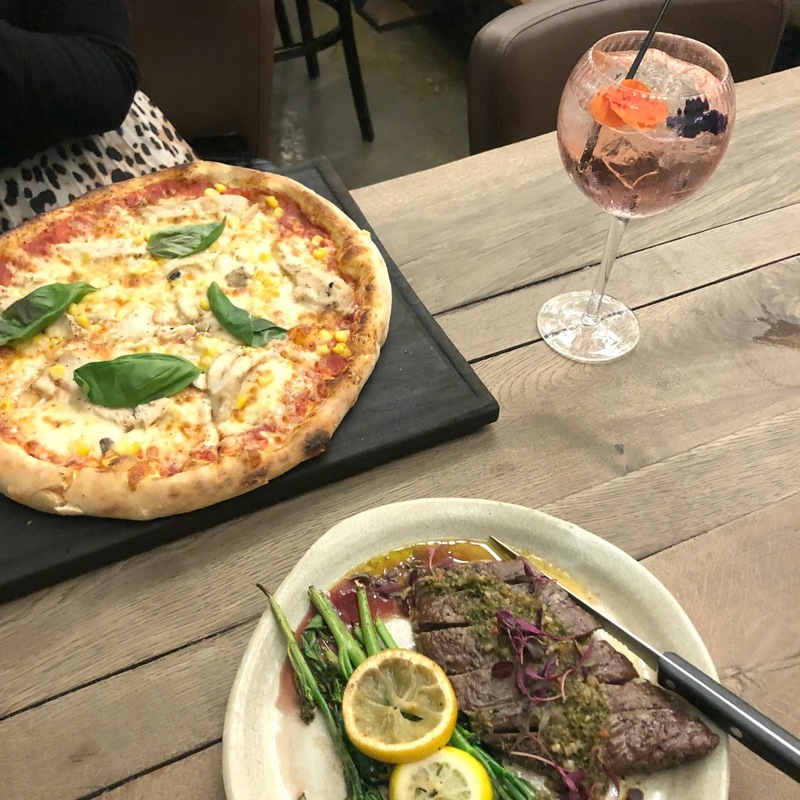 I really enjoyed revisiting The Herb Garden and trying out something a bit different from their menu, I have to say though that, if I'm being completely honest, I really missed the pizza and I really do think that they are the best offering on The Herb Garden menu! I spent most of my meal eyeing up my friend's pizza and wondering if she'd notice if I swiped some. So yes, The Herb Garden isn't just about the pizza, but if you're a fan of perfect crusts, gooey cheese and delicious toppings there really is no other way! I was treated to a complimentary meal for two at The Herb Garden in exchange for this honest review. We have a long running joke in our car that whenever we drive past somewhere I want to visit I will make a big thing of pointing it out and exclaiming "ah we need to go there" every single time. Belsay Hall, Castle and Gardens is somewhere I've been pointing at for as long as I can remember so we decided that this year we should perhaps stop pointing at it and finally make a visit. Having heard that the snowdrops at Belsay are pretty special it seemed like the perfect excuse to make a plan. Run by English Heritage, Belsay is a particularly unique place unlike any other I've ever visited in the North East. Where else can you see Grecian architecture, a medieval castle and 30 acres of gardens all in one place? Just imagine living in a place like that! 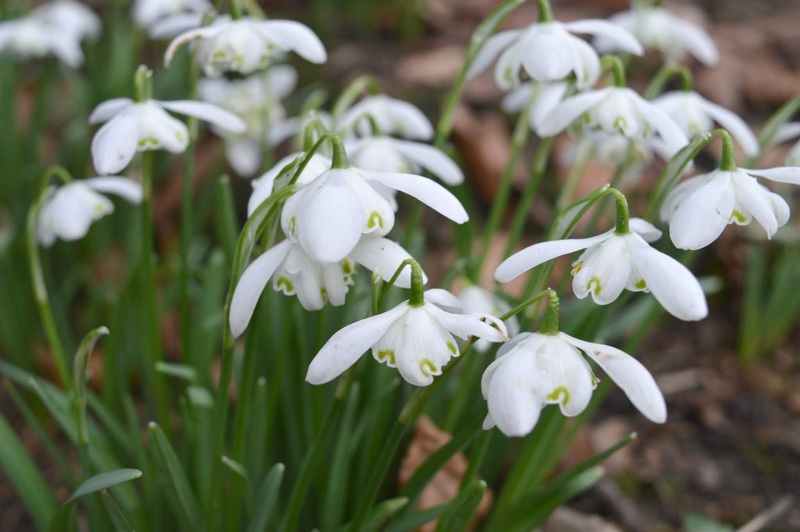 As it was our first visit, the ladies at the front desk were so helpful giving us a brief history of Belsay and directions around the estate and when I started enthusiastically quizzing them on the snowdrops they pointed out the best areas for me to find them. I really love having a proper introduction when we're exploring somewhere new and they were so friendly. 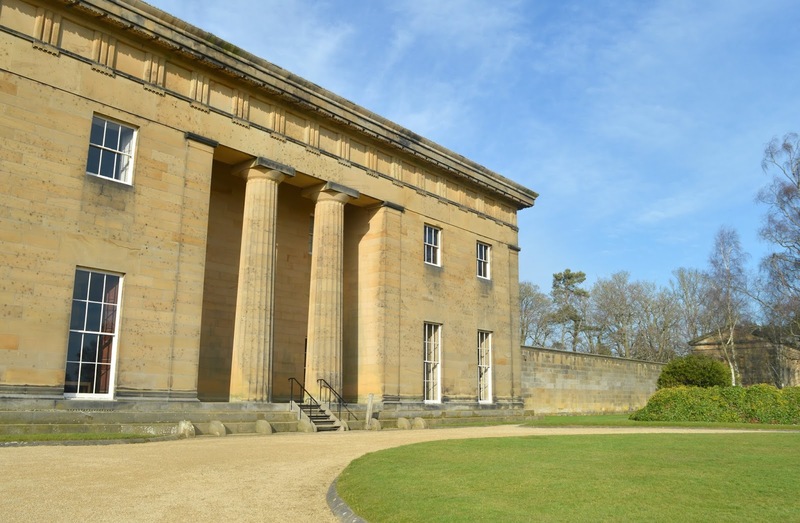 We began our adventure at Belsay Hall, a beautiful country mansion with a twist, the owners decided to model their home on a Honeymoon trip to Athens and the Greek-revival architecture was absolutely stunning. Simon and I aren't usually particularly fussed about looking round the interiors of stately houses and much prefer exploring the grounds outside but we were both speechless stepping into the Hall for the first time. It was seriously impressive. 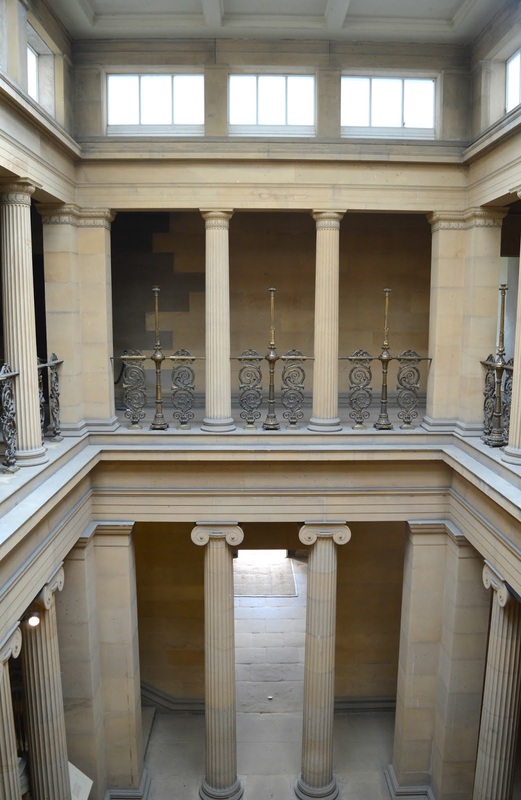 With huge columns and the most spectacular natural light, the Hall has been left unfurnished so you can truly appreciate the building in its natural state. Upstairs is a warren of rooms with fire places, original wallpaper and huge windows showing off some really lovely views of the Northumberland countryside. The main reason for our visit in the Winter was to see the snowdrops. Belsay Hall has come up in my research a lot when I've been hunting down the best snowdrops in the North East so I've been keen to see them for a while. The snowdrops at Belsay are scattered around the site and we found our first small cluster close to the Hall. There are several types of snowdrop at Belsay and the ones near the Hall are particularly spectacular and a variety I've not seen before. They had perfectly formed almost claw shaped flowers and certainly weren't the same as those you tend to see littering the floors in woodland. 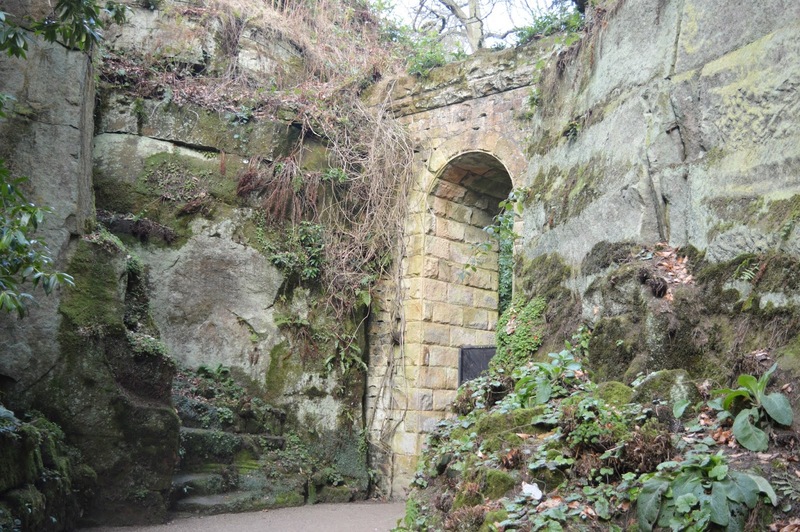 The walk from the Hall to the Castle is around half a mile and took us through the Quarry Gardens, 30 acres of Grade I listed gardens built around winding paths and huge rock formations. 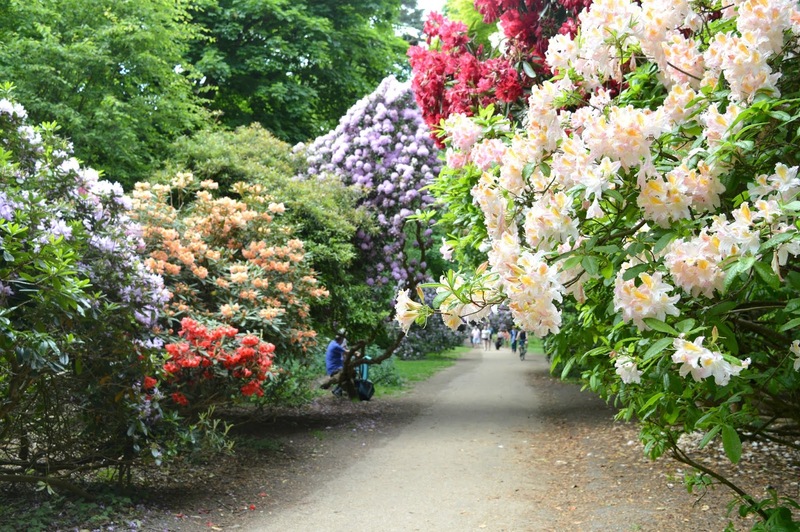 Although there aren't too many flowers in the Winter, I hear that it's a stunning walk in the Spring and Summer with one of the biggest collection of Rhododendron in the country. I bet the colours look stunning against the backdrop of the dramatic rocks and I'm definitely making a plan to return in the warmer months to experience it for myself. Belsay Castle suddenly appeared in front of us with little warning, looking beautiful against the Northumberland countryside, it's designed to impress. I found myself doing a little skip as we headed towards it, if there's one thing I love it's exploring a castle, perhaps it's my inner diva screaming to be a princess! 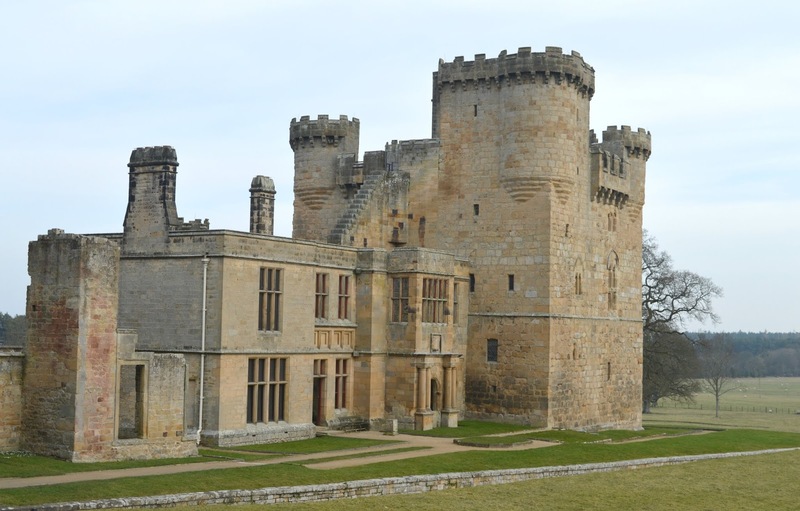 Belsay Castle is partly ruined and is full of secret rooms, winding staircases and hidden corners - perfect for exploring (or losing your husband in!). We had a good explore as we made our way through the building imagining what life must have been like when the castle was first built. As a huge fan of views I couldn't wait to get myself up the 56 spiral steps to the top of the tower, it's probably the only time that you'll ever see me that keen to climb that many stairs and knowing how great the view at the top was going to be I couldn't wait to get to the roof. 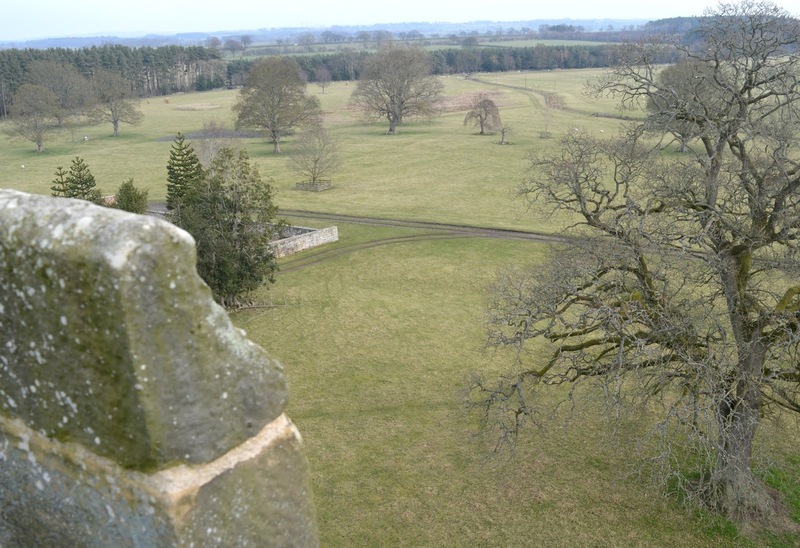 The view across the Northumberland countryside was beautiful, we could see where we'd just walked, spotted a few more snowdrops and enjoyed trying to guess what other places we could see as we peeped between the turrets. The walk back to the entrance from the Castle is where we found most of the snowdrops, little clusters of them dotted underneath the trees. Every time we spotted some more I couldn't resist stopping for a look. They really are so beautiful and I can't help but feel so excited about Spring every time I see them. We finished our visit with lunch at the Victorian Tearoom. We usually take a bait box with us but I'd read that they serve stotties in the tearoom and if there's one thing I can't resist it's a stottie. We'd got slightly chilly walking around the estate so a hot sausage stottie was the perfect treat to warm us up - did I mention how much I love a stottie? The tearoom at Belsay is pretty small so if you're planning a visit I recommend lunching early, we had our bums on a seat by 12:00 pm and within about 10 minutes every seat was taken. We really loved our first ever visit to Belsay Hall, Castle and Gardens and since being on our trip so many people have told me about the great memories they have of enjoying the estate as a child so if it's been a while since you last visited I highly recommend popping by for a visit and if, like me, you love snowdrops it really is one of the loveliest place in the North East for a stroll. Belsay Hall Castle and Gardens is run by English Heritage and costs £9.50 for adults, £5.70 for children and £8.60 concessions. Members of English Heritage are free. Opening times are daily 10:00 - 16:00 but please check the website before you visit. There is a free carpark on site with two overflow carparks. We are very kindly given a complimentary press pass every year to enjoy the English Heritage sites in the North East at our leisure. English Heritage had no idea we were visiting on this day and have not asked us to share our day. Ask Simon about my obsession with seeing North East flowers in bloom and he'll probably roll his eyes and tell you about "that time we drove miles to see daffodils that ended up not being there" or how I "tricked him into driving to Scotland just to see some snowdrops" - in fact every time I mention wanting to go out on the seasonal flower trail he will reluctantly agree but only if I promise not to throw a diva strop if we get there and there are no flowers to be seen! Luckily, having now lived in the North East a fair few years, I've become somewhat of an expert in where to head to see the most beautiful seasonal flowers and I'm hoping that some of you might be as geeky about flowers as I am. If you fancy exploring this year and seeing the very best North East Flowers in bloom I've put together this little seasonal trail for you. Winter isn't exactly famed for its beautiful floral displays but come February the Snowdrops arrive, and I just love the promise of Spring that they bring. After months of dark, cold days the first sign of flowers in the Winter time always lifts me straight out of my funk and perhaps that makes them the most special. Beautifully delicate, the dainty little white flowers give me so much joy and every year we try to head somewhere new to see them. 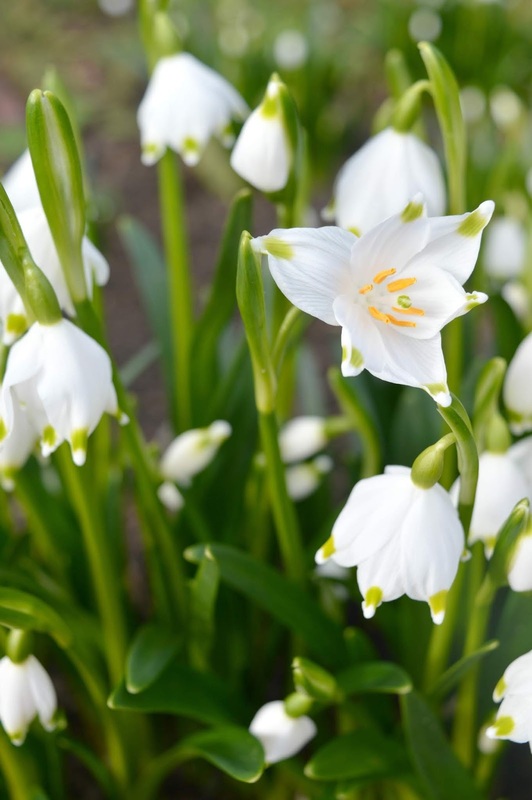 We are pretty spoilt in the North to have some truly beautiful snowdrop displays to enjoy so there's plenty of opportunity for Winter day trips if you fancy seeing them for yourself. Best enjoyed on a crisp, sunny day, I absolutely love strolling through the woodlands on a snowdrop spot. 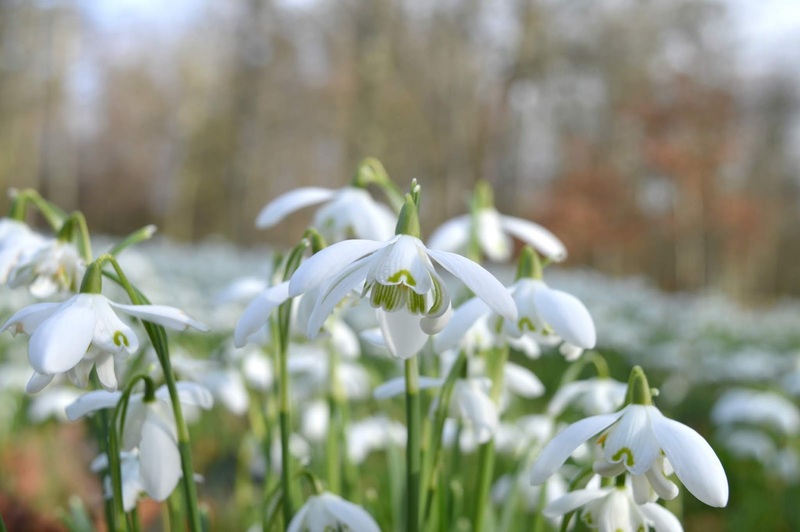 We've had a couple of snowdrop adventures over the years and if you're wanting to head somewhere on the doorstep then I highly recommend a trip to see the snowdrops at Wallington, one of our favourite National Trust sites in the region, visitors have been planting snowdrops since 2015 to ensure each year we are treated to an impressive display. 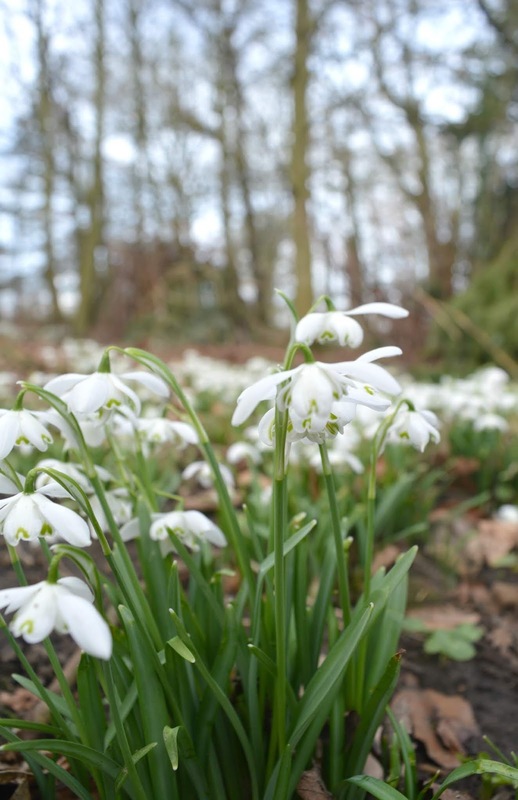 Most of the snowdrops are in the East Wood and the snowdrop trail offers a beautiful white carpet of flowers. 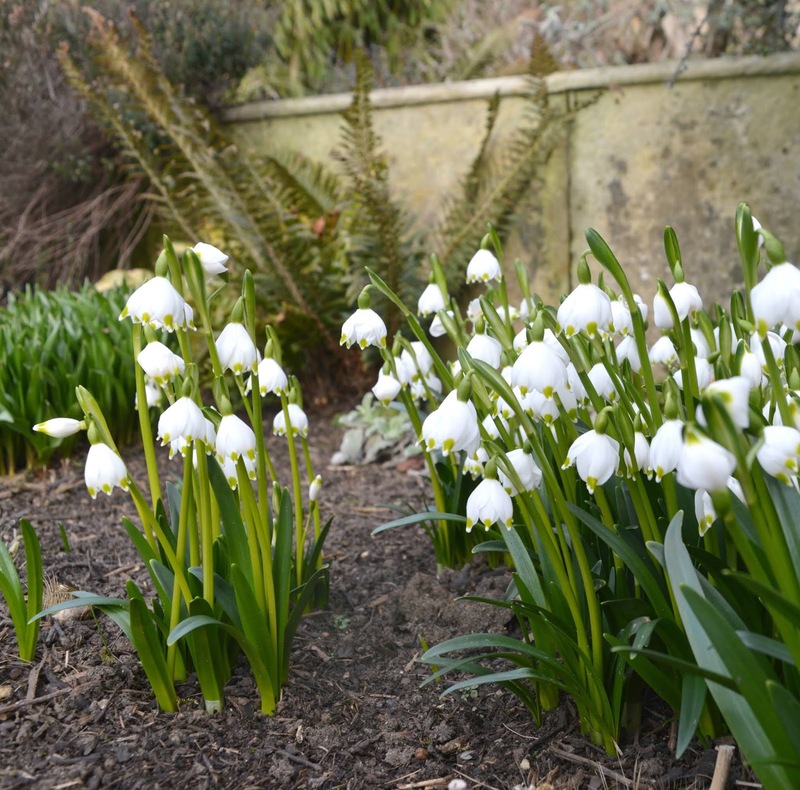 Of course, one of our very favourite things about snowdrop spotting at Wallington is the tea room - snowdrops and cake are a winning combination! 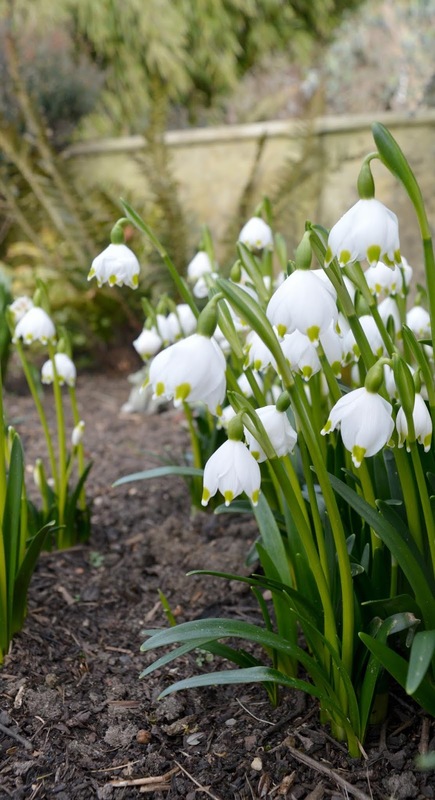 If you fancy heading further afield Floors Castle in Kelso, on the Scottish Borders has an incredible snowdrop display which you can see during their annual Snowdrop Weekend - the perfect showcase for the first blooms of the season. The grounds are usually closed during the Winter months which makes going to see the snowdrops extra special - out of all the displays I've seen I'd say this one is the most impressive! The arrival of flowers in Spring is one of nature's best displays. The iconic flowers are so bright and colourful and there are so many different types to spot. Perhaps the best thing is you don't have to make a special journey to see Spring flowers, in fact there's a roundabout in Gateshead that's always covered in beautiful daffodils, a nice daily dose of sunshine on the morning commute! Crocuses are always the first of the Spring flowers to appear and if you want to see a truly magical floral display the Crocus lawn at Wallington is simply breathtaking. The purple flowers are stunning close up but I prefer to take a few steps back to appreciate the effect that they create, it looks like someone has come along and spilt a giant pot of purple paint all over the lawn - absolutely beautiful and a must to include in our seasonal trail. There are so many great places to see the daffodils in the North East that I don't even know where to start, we really are vey spoilt. 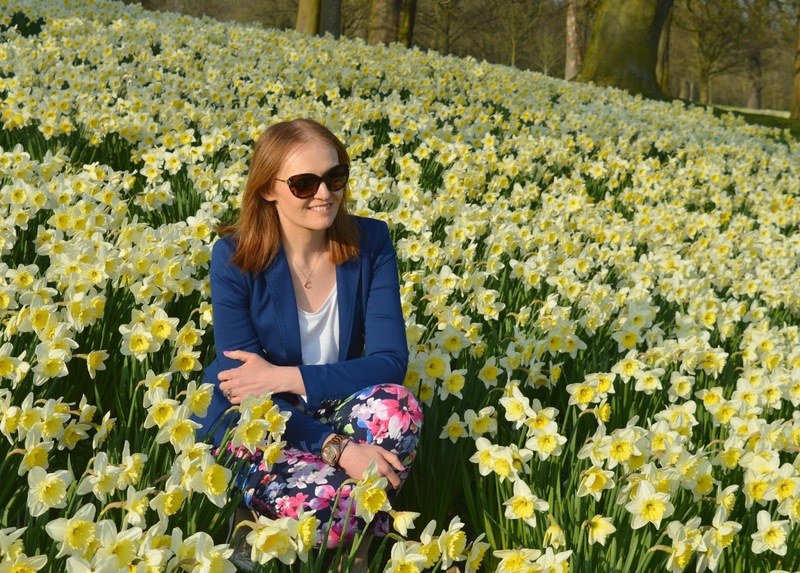 Wynyard Hall is one of our very favourite places in the region and as well as being one of the best luxury hotels in the North it also has a jaw dropping daffodil display. A short stroll from the hotel entrance you'll find a bright yellow sea of flowers that is definitely worth seeing. Of course, the added incentive of going to Wynyard on the daffodil hunt is that you may as well have a cheeky spa visit or perhaps an afternoon tea while you're there and really made a day out of it! I'd heard so many things about the beautiful daffodils at Warkworth yet when we saw them with our own eyes for the very first time they still took my breath away. 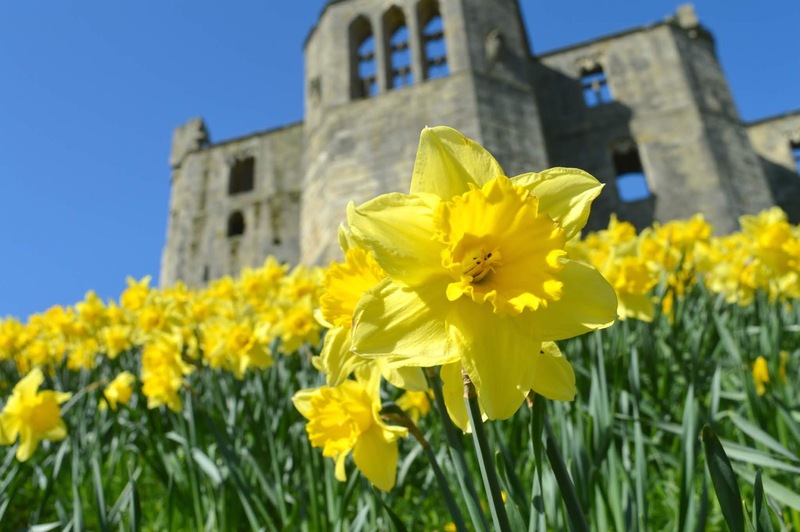 Probably the most beautiful seasonal flower display you'll find in the North East the yellow flowers cover the hill under Warkworth Castle and look absolutely spectacular in the Spring sunshine. Warkworth is also perfect for a potter so a great place to spend the day with some beautiful walks and tea rooms to enjoy after the daffodils. Read more about our daffodil adventures at Warkworth here. We had some pretty impressive bluebell displays in the Norfolk woodlands where I grew up so seeing these beautiful little purple flowers always takes me back to my childhood. As soon as I see them I'm transported to care free days skipping about the woods with my friends - I just love that flowers can trigger my memories in such a vivid way. 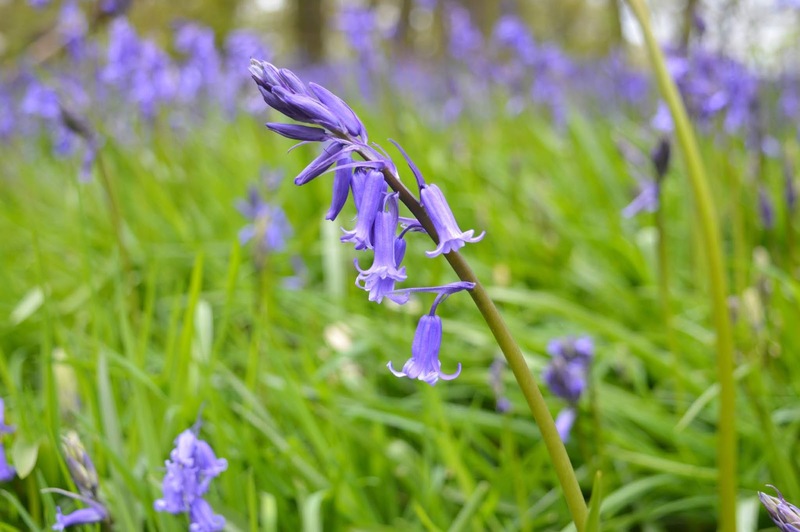 There are a couple of lovely places to see bluebells in the North East. 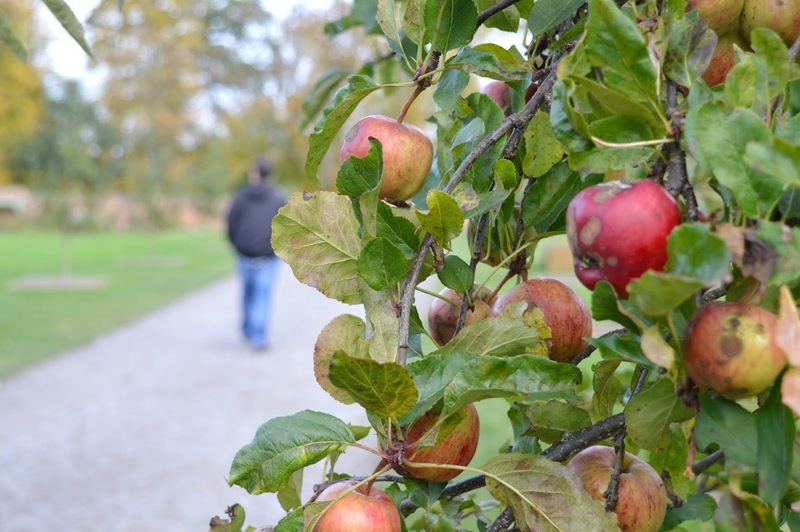 The short woodland walk at Seaton Delaval Hall is perfect if you have little ones and it offers a very peaceful escape if you fancy a moment of silence. I do sometimes wonder if the woodlands at Seaton Delaval Hall are a secret because you don't often find many people there so it's the perfect place to truly appreciate some true natural beauty. Is there anything more beautiful than trees full of pink blossom on a beautiful Spring day? When it comes to blossom spotting in the North East you have to be very very quick as it vanishes almost as soon as it appears so this one is definitely a plan best put into the diary! The Cherry Blossom Orchard at Alnwick Garden is somewhere I'm determined to get to this year (can you believe we've not actually been!) - with the largest collection of Tai-haku outside of Japan, if you want to see it for yourself you have to be quick as it's only in bloom for two weeks a year. The orchard features winding pathways through the trees and huge swings offering a unique way to enjoy the blossoms. I can't wait to visit! 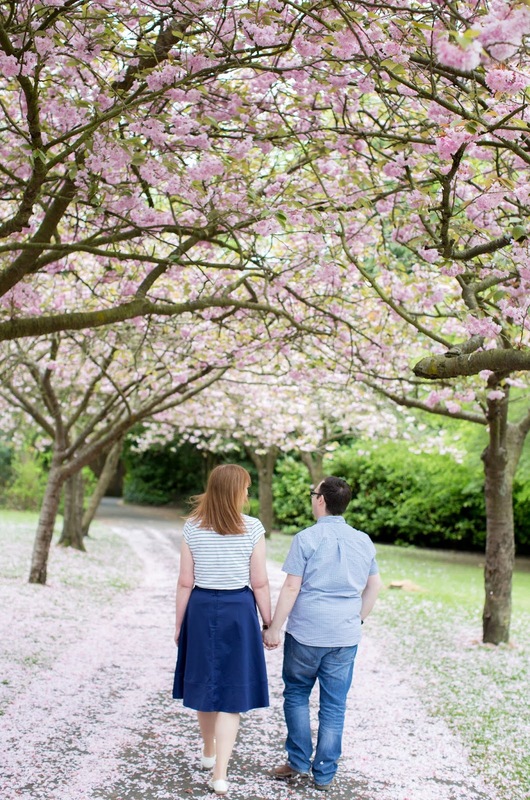 Sometimes the very best floral displays are completely free and one of the loveliest spots to see pink blossom is Saltwell Park in Gateshead where the blossom trees tower above pathways covering them in a pretty trail of pink petals. The perfect place for a nice stroll on a bright Spring day. Summer brings the most vibrant colours and exotic flowers to the North East, yet it seems to be a season that we're yet to explore properly. A fair bit of the Summer blooms trail we'll be doing ourselves for the first time this year and I can't wait to discover what's on offer. We haven't seen the Rhododendron at Cragside for ourselves yet so it's very high on my list of plans for the Summer this year. For a few weeks the estate is transformed into a sea of colour with stunning white, purple and pink flowers on display. There are also plenty of walks to do around the grounds and wider estate so this part of the seasonal trail is best enjoyed on a full day out, perhaps with a picnic basket! Another place I'm determined to tick off the list this year is a visit to the Lavender fields and this one involves a bit of an adventure south. Unfortunately there are no lavender fields close to home but there are a couple in Yorkshire that are easily reached from the North East including Yorkshire Lavender near York which offers a lavender maze as well as the lavender gardens and a pretty spectacular view of the Yorkshire Dales. Rural Northumberland is well known for its wide open moorland and if you want to go and see the beautiful purple heather then the ridge of the Simonside hills is where you need to be heading. The Ridge Walk offers very special 360 degree views across the hills of Northumberland. I've had a brief glimpse of the beautiful purple hills but I'm determined to go for a proper explore this year. Autumn isn't exactly well known for its seasonal flowers so when it comes to the fall months I love to get out and about hunting the most colourful leaves in the North East. With an abundance of woodlands in the region there are plenty of places to head for a walk in the leaves. Gibside is one of our favourite places to head for the beautiful colours of Autumn, with plenty of trails through the woodlands each walk tends to take us hours because we just can't resist stopping for endless photographs of the eye catching orange and brown leaves. The landscape is beautiful and if you want a proper kick about in the leaves you won't be disappointed. 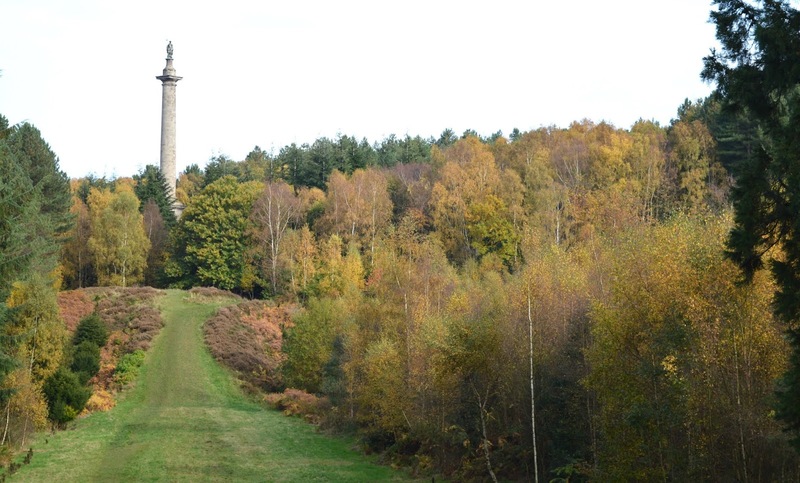 Of course the list of woodland walks we have in the North East are endless so if Gibside doesn't take your fancy there are also some beautiful Autumnal displays at Plessey Woods, Chopwell and Thornley Woods. 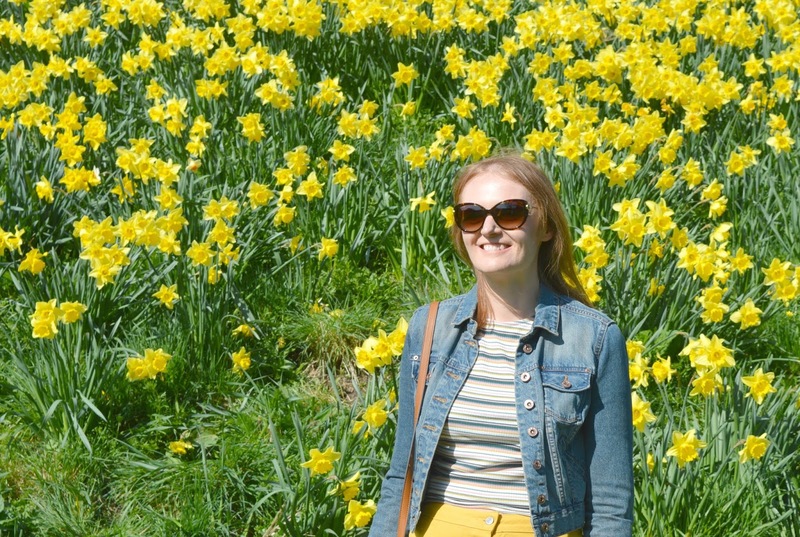 This guide only really scratches the surface, if I included all of the amazing places in the North East to see flowers in bloom I wouldn't actually have the time to get out there and enjoy any of them! I know we have so much more to discover so if you have any recommendations I'd love to hear them. Where are your favourite places to see the seasonal flowers?